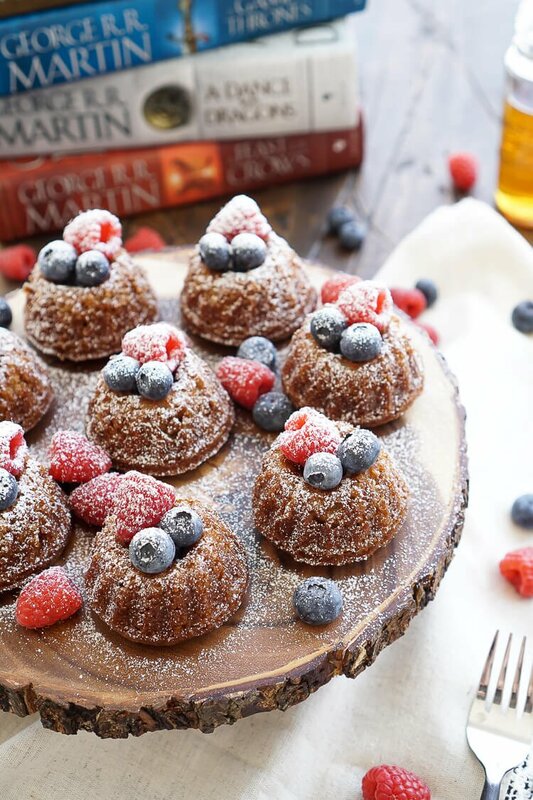 This Game of Thrones Honey Cake recipe can be made up ahead of time and is loaded with comforting flavors like honey, cinnamon, and nutmeg and laced with coffee, orange juice, and bourbon. Another season of Game of Thrones is upon us and for the first time, book readers are left pretty much unknowing as to what this season will bring. It’s a weird feeling, especially with so much uncertainty as to where the story is going as a whole and how the HBO series has already diverged from the novels in so many ways. Start Your HBO Subscription With Amazon Now! SKIP THIS SECTION IF YOU’RE NOT CAUGHT UP! But one thing is certain for me; Jon Snow is NOT dead, or at least he won’t stay that way. You see, in the books, the foreshadowing and pieces of the puzzle are much stronger than they are in the show, and it’s something that I really wish HBO had left untouched. In the books, it’s strongly indicated that it’s not even Jon Snow who gets stabbed to death. I mean it is, but it isn’t. In the books, Melisandre makes Mance Rayder (The King Beyond the Wall) appear as Rattleshirt and vice versa, so it’s actually Rattleshirt that burns alive at Castle Black. So it’s assumed that she does the same to help Jon because she sees the future in her fires. Buy Game of Thrones for Kindle Now! Did you know that when George R. R. Martin started writing this series, it was actually supposed to be all about Bran? You know, the Stark kid that got pushed out of the tower in season one and has been hanging out beyond the wall with the three-eyed raven and whom we didn’t see all last season. Yeah, thank heavens Martin felt compelled by the other characters, right? Actually, I like Bran, and his storyline was a bit more interesting in the books (hey there, cold hands), and I’m really excited to see what the series does with him. As for all the other characters and where we left them, I’m excited for Arya to turn into a full-on badass, and I’m so bored with Dany it’s not even funny. Sansa and Theon’s storyline intrigues me because while Sansa’s is WAY different than the books, Theon’s seems mostly on point. Oh, and let’s not forget that HBO is finally delving into a big part of the series from the books, The Iron Isles… yawn. 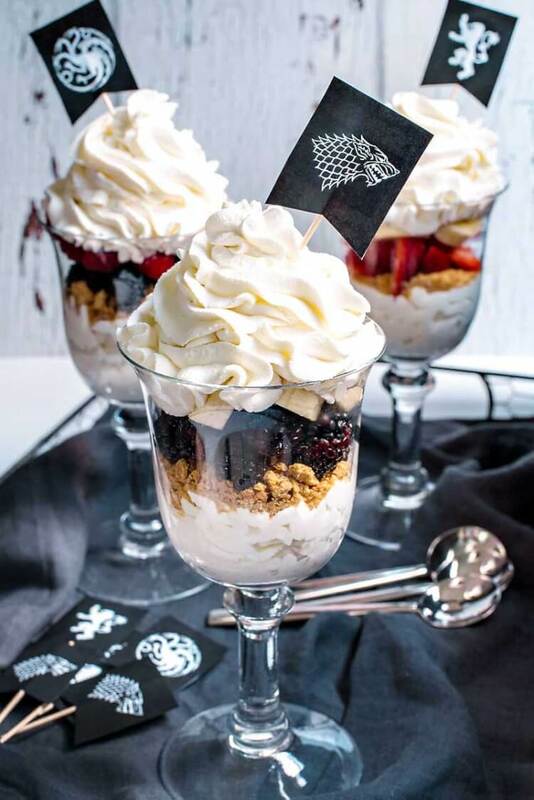 Buy a Game of Thrones Drinking Glass Now! And then there’s Tyrion trying to hold Dany’s kingdom together and all the crap going on in King’s Landing. I’m also excited to see more of Brienne, who’s more than likely with someone who also isn’t dead. Oh, and I have a feeling we’re also going to be seeing The Hound since he’s probably not dead either. One thing you come to learn from Martin is that if you don’t see them die, they’re not dead. Oh, oh, and I’m also really excited to see the flashbacks, and I’m secretly hoping we’ll catch up with little Rickon too, who’s probably now like 18 because we haven’t seen him in FOREVER, but that might not happen until season 7. Alright, well that’s enough rambling for one day, it’s time for all of you to get ready for the premiere and by get ready, I mean make this honey cake recipe! This honey cake recipe, or rather honeycakes as they’re referred to in the books, is a sweet and spicy dessert cake that holds all the comforts of home. 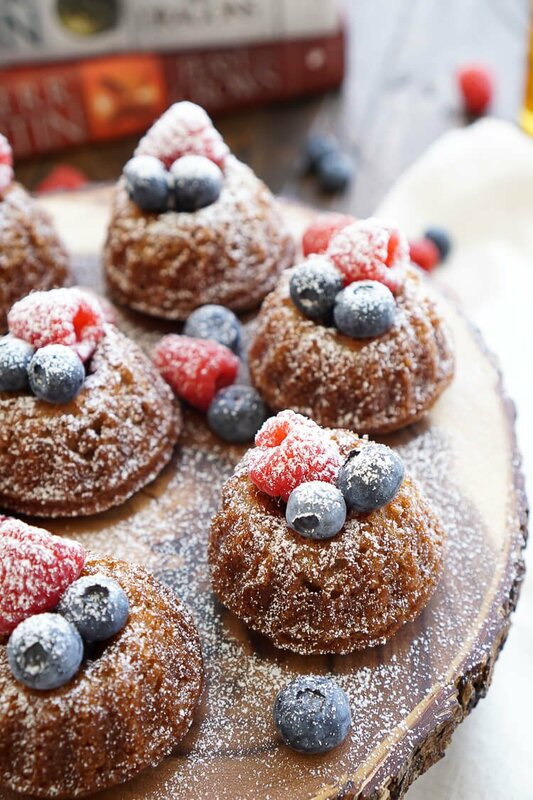 Laced with spices like cinnamon and nutmeg and loaded with honey, coffee, and a little bit of bourbon, these cakes PACK some massive flavor. 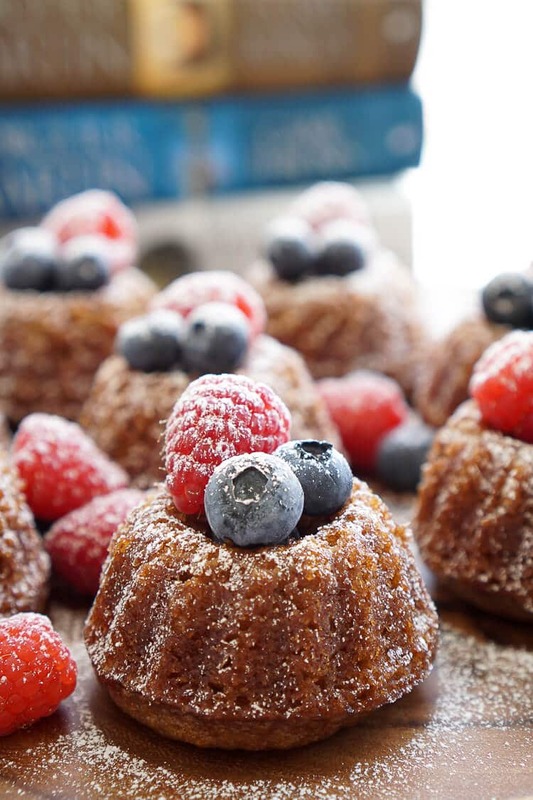 The final touch of berries and confectioners’ sugar add a closing note of freshness and tart juiciness to every bite! 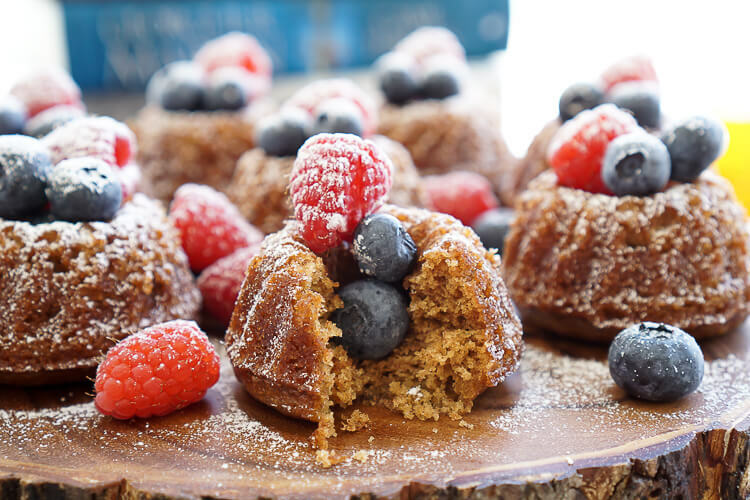 Preheat oven to 350 degrees F. Spray a mini bundt pan with cooking spray and set aside. In a medium bowl, combine flour, baking powder, baking soda, salt, cinnamon, cloves, nutmeg, and ginger and set aside. Add oil, honey, sugar, and eggs to a large bowl or stand mixer and beat together until combined, scraping down the sides as needed. Add vanilla, coffee, orange juice, and bourbon to a medium bowl and stir together, add to the eggs and sugar mixture alternately with the flour mixture until fully incorporated. Add 1/4 scant cup to each mini cake well and bake for about 15 minutes, until toothpick comes clean. Remove from oven and let cool in the pan for about 15 minutes. Gently run a toothpick along the outer edge of the cakes and use your fingers to gently twist the cake until it comes free. 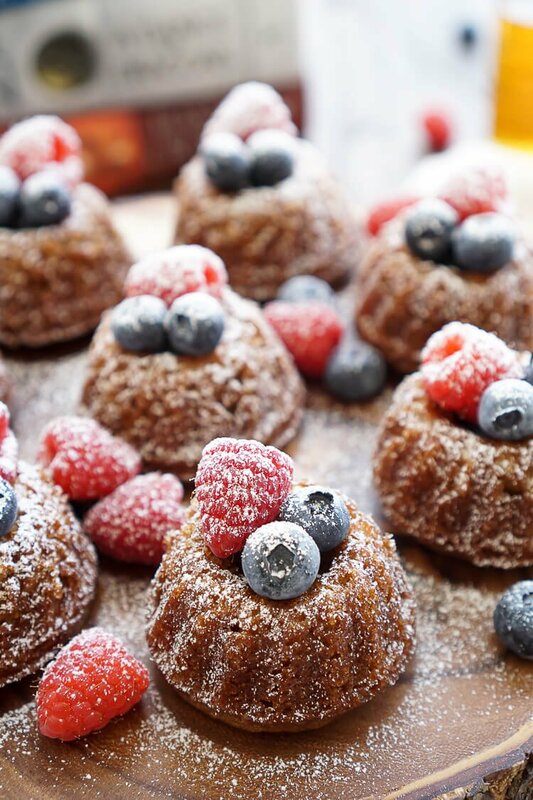 Top with berries and confectioners' sugar. 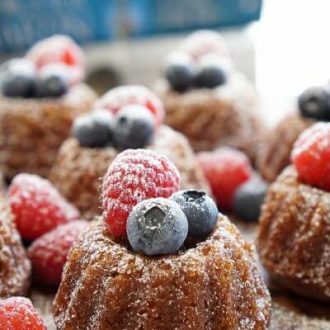 Cake can also be baked in a 9 x 13-inch pan or a large bundt pan for about 35 to 45 minutes until toothpick comes clean. 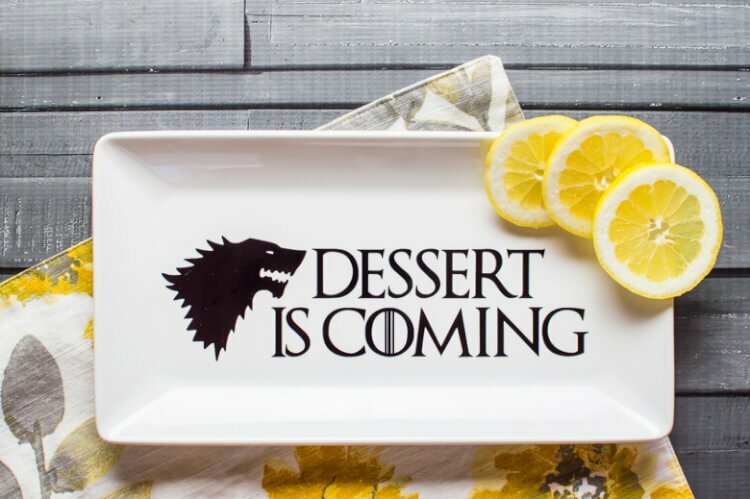 You might also enjoy these other Game of Thrones inspired posts! 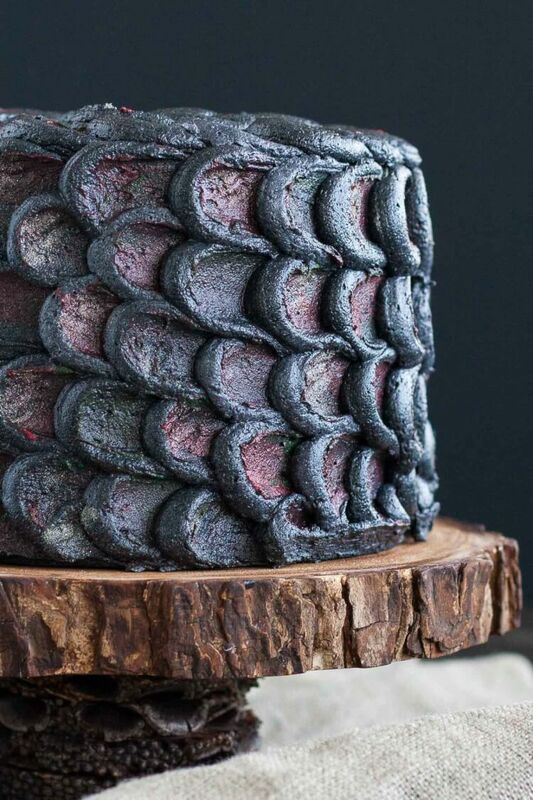 I don’t watch Game of Thrones but I could CERTAINLY watch myself eating these amazing little cakes! 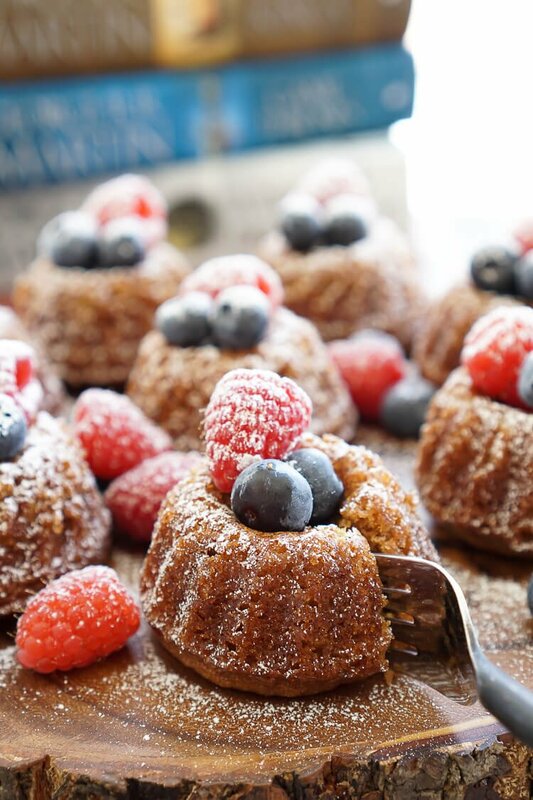 I love the addition of coffee, OJ & bourbon in these… so much flavor! Awwww, thanks Holly, you are far too sweet! Your post honestly made me squeal with joy. Jon Snow is most definitely not dead! My husband hasn’t read the books so I’m not allowed to “spoil” anything for him, but I’ve been dying to tell him about all the clues from the books that point to him being alive. But there are so many. And I definitely buy into the whole R+L=J theory. I didn’t know that the series originally was supposed to be all about Bran, but I am so glad that GRRM branched out and wrote about all the different characters. Though, I love Bran’s story in the books and I’m excited to see where the show is going to take it. And now that we have no books to reference, it’s kind of a weird feeling not having a general idea of where the story is going to go at this point! I know, right! SO MANY CLUES, and I’m excited for the flashbacks because I think a lot of them will focus on that very theory! Isn’t it interesting how stories develop, I remember reading the Martin interview about how things started and how the story just took on a life of its own! I’m mostly excited to see Bran *fly*! I feel like the Iron Isles are all we really have left other than the stuff they’re not covering in the series… ehemmm, Lady Stoneheart. And I’m really curious to see how they do it and also slightly terrified that the HBO ending might be the only ending we ever get. Yes! I am also bored to tears with Dany’s storyline. Glad I’m not alone! I have the same theory about Jon Snow! I’m so excited to see how everything develops. Maybe we’ll actually see some of Bran this season? He’s been all but an afterthought forever. And I’m super excited to see where Arya’s storyline goes!! Oh, I’m sure it’s going to be an intense opener for sure! I love Arya and I think a time will come where we don’t see much of her and then she’ll come back into the picture as a faceless man to save the day later on. I’m excited for Bran too and look forward to watching his storyline fold back into the others! I hope you enjoyed the premiere, the ending was quite interesting!